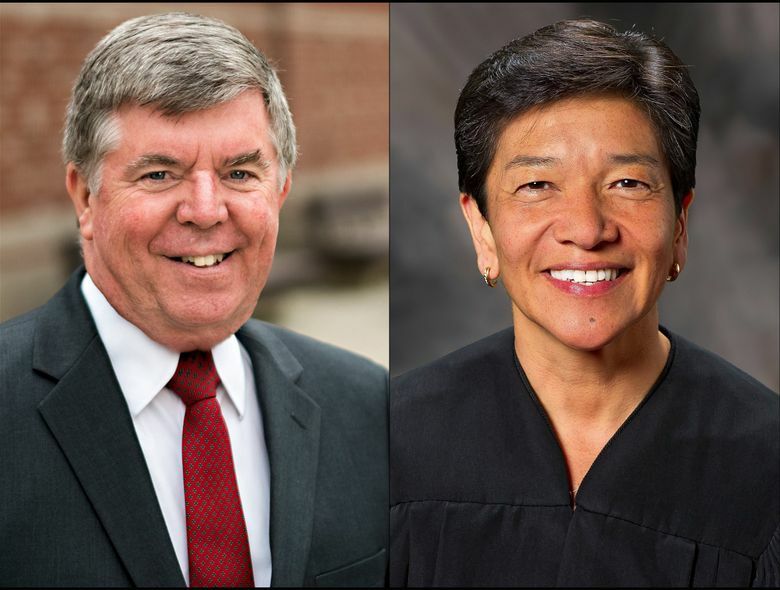 The candidates seeking to unseat three current justices in the Nov. 8 general election have criticized the court’s handling of education issues, but the incumbents will be difficult to defeat. In an effort to derail Chief Justice Barbara Madsen in her bid for re-election to the state Supreme Court, charter-school proponents unhappy with her spent $130,000 on phone calls and digital ads before the Aug. 2 primary to help her opponent, Kittitas County Prosecuting Attorney Greg Zempel. At the same time, another group, backed by Camas billionaire Ken Fisher, dropped $100,000 for radio ads opposing Madsen. Despite this, Madsen garnered 64 percent of the state vote, capturing every county but Kittitas. Zempel, who believes the court is “broken,” survived for the Nov. 8 general election as the second-place finisher in a three-person race. But the outcome suggests he faces an uphill battle. Likewise for Gonzaga University law professor David DeWolf, an Eastern Washington candidate seeking to unseat Justice Mary Yu. Yu, a former King County Superior Court judge with a strong base and more donations than any other Supreme Court candidate, is seeking her first full six-year term after being appointed in 2014 and winning a two-year term. 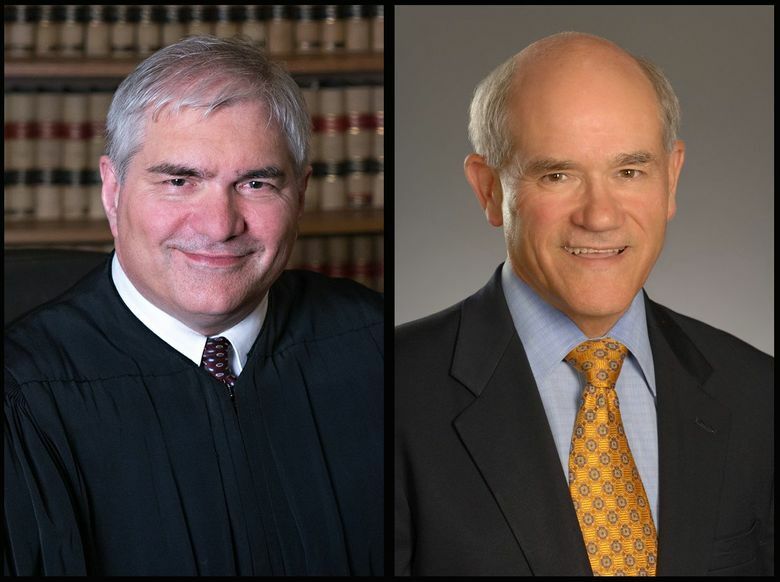 Winning also will be a challenge for Dave Larson, presiding judge of the Federal Way Municipal Court, in his race against Justice Charlie Wiggins, who has collected key endorsements and raised far more money in his bid for a second six-year term. Larson and DeWolf, like Zempel, have been critics of the court’s September 2015 decision striking down the state’s voter-approved charter-school law. 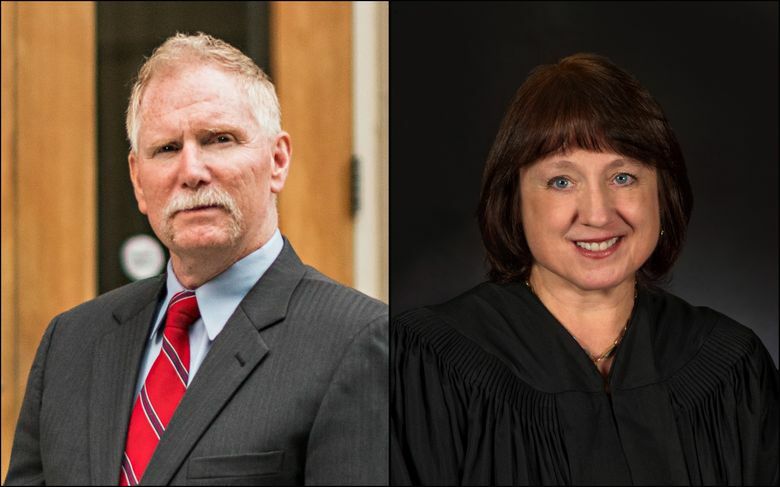 The three challengers, despite running in nonpartisan races, also have echoed complaints of Republican lawmakers who believe the court overstepped its bounds by holding the state in contempt in the McCleary school-funding case. In its 2012 decision, the court ruled Washington is violating its constitution by underfunding K-12 schools. Although lawmakers and Gov. 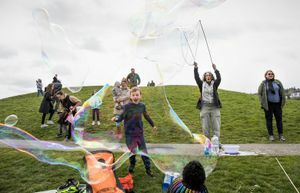 Jay Inslee have poured billions of dollars into the school system in recent years, the court hasn’t been impressed with the state’s progress on putting together a full funding plan. The justices in 2014 held the state in contempt for lack of progress on drafting a detailed funding plan and last summer added $100,000-per-day fines against the state. In the 2016 legislative session, lawmakers and Inslee didn’t put forward a major proposal. Instead, they passed a bill setting up a task force to collect data and make recommendations for the 2017 legislative session. After holding a recent hearing, the court now must decide whether to lift contempt sanctions, impose harsher penalties, or wait and see what lawmakers and Inslee do in the 2017 session. In the charter-schools case, the court drew criticism for creating chaos for hundreds of families whose children had already started classes. In response, the Legislature passed a fix that became law this year. Madsen wrote the majority opinion in that case; Wiggins and Yu joined in the decision. Wiggins, 69, in an interview with The Seattle Times editorial board, defended the charter-schools ruling against criticism the court sought a means to an end. “I think we were trying to determine … does this fit within the constitutional parameters?” Wiggins said, asserting the decision followed precedent. He explained the timing of the ruling as the product of a hotly contested case that went through multiple hands and schedules on the court. But the court needs to finish its work sooner and is doing a better job, he said. Larson, 58, said the decision’s tortured reasoning and misapplication of precedent “broke my heart” and heavily influenced his decision to run for the Supreme Court. The timing, he added, shook public confidence in the court. Regarding McCleary, Wiggins defended the court’s finding and follow-up. “Have we stepped over the line? I don’t think so,” he said while acknowledging that fines might not be working and other measures may be necessary. Larson, a former Federal Way School Board president, told The Times editorial board he agrees with the rationale behind the McCleary ruling. But solving the problem lies with the Legislature, not the court, under separation of powers, he said. “The remedy is for the voters to vote them out office,” he said of the legislators. DeWolf, 67, a critic of the school-funding and charter-schools rulings, describes himself as a believer in judicial restraint and predictability. “The job of the court is not always to get the right public policy,” he said. “The job of the court is to ensure that the system functions in a way that makes people feel, ‘Hey, there is a set of rules …,’ ” he told The Times editorial board. Yu, 59, who wasn’t on the court when it ruled in the McCleary case but was when it found the state in contempt, told the editorial board she, too, is an advocate of judicial restraint. But the McCleary decision isn’t an example, she said, calling it a legal and constitutional question regarding basic education for children. DeWolf agrees the Legislature has “fallen down” on its funding responsibility. But the cure is not for the court to take over the Legislature’s job without a clear way to resolve the dispute, he said. Rather, the solution is getting a new Legislature, he said. As a result, the court has endangered its integrity and authority, DeWolf said. Yu said she’s told people she is “so sorry” for the timing, blaming it on the court’s method of circulating cases among the judges. More emphasis needs to be put on timing in some cases, she said. On other issues, DeWolf said he supports allowing teachers, as a First Amendment right, to raise intelligent design as an alternative theory to natural selection, and believes states should be allowed to set abortion rights. Zempel, 53, a six-term Republican prosecutor in Kittitas County, said in an interview he probably would have voted in the majority in the McCleary case, subject to knowing all the facts. But the ultimate judges on whether the Legislature is complying should be the voters, not the Supreme Court, he said. Similarly, he is critical of Madsen’s reasoning in the charter-schools case, calling it “an example of the political nature of the court,” and he faults the timing of the decision. Zempel said he’s thankful for the financial support he’s received from charter-schools proponents but brushed aside any suggestion he is anti-education. His wife, a speech pathologist, has been a member of the Washington Education Association, the big teachers union, for more than 35 years, he said. And he’s an early-education proponent, he said. He aimed some of his most pointed comments at the Supreme Court’s handling of criminal matters, asserting it has issued impractical rulings that favor offenders. “I’ve watched this court, and in particular Barbara Madsen, write opinions that with the stroke of a pen change the precedent in the criminal cases and how we as law enforcement do our jobs,” he said. As an example, Zempel cited a 5-4 ruling in 2002, authored by Madsen, that struck down part of the state’s felony-murder law and overturned the conviction of a man who had been charged with second-degree felony murder after unintentionally killing another man during a barroom brawl in West Seattle in 1994. Mentored by the late King County prosecuting attorney Norm Maleng, Zempel said he adopted Maleng’s widely respected approach of running a nonpartisan, professional office. He countered the notion he’s a candidate with a solely Eastern Washington viewpoint, pointing out he spent half his life in Seattle, attending Roosevelt High School and the University of Washington, and understands both sides of the state. With zero name-recognition statewide before the campaign, he insisted he performed near his target of 32 percent in the primary — garnering about 30 percent of the votes — and is working hard to build off that. Madsen, 64, is seeking her fifth term on the court, where she’s been chosen twice since 2009 by her colleagues to serve as chief justice. She said in an interview she agreed with the merits of the McCleary ruling but cast a dissent against retaining jurisdiction. In her 2012 opinion, she wrote, “Adopting specific standards or guidelines for defining and funding basic education is a legislative responsibility; it is not a judicial function.” The court, she argued, had other tools to use later if the Legislature failed to carry out its constitutional duty. But after the ruling, she said, she viewed the decision as precedent. As chief justice, she said, she “got on board,” taking a “leadership role” and supporting the contempt action as a matter of upholding the court’s decision. Her finding in the 6-3 charter-schools ruling, she said, was based on the clear legal premise that such schools are not common schools and thus the funding mechanism flowing from that designation could not be treated separately. Explaining the timing, Madsen said that while the Supreme Court and appeals courts have looked for ways to speed up rulings, timing is always subject to the court’s usual process. In addition, the plaintiffs never exercised their option of asking for expedited review, she said. Furthermore, she said, after issuing the September ruling, the court, in a rare move, granted time to charter proponents to prepare a brief seeking reconsideration and allowed the “status quo” to remain in place until December. In both school matters, Madsen said, the “bigger picture” is that the court did its job after the cases came up through the court system. On criminal matters, she said, she has, in some instances, opposed stances of her colleagues, coming down in favor of “common sense” and law enforcement. Beyond handling cases, Madsen said, she has worked to improve diversity and equal access to justice in the court system. Going forward, she wants to use technology to make it easier for people to interact with the court system.